Do you believe in leprechaun's? Ryan sure does. 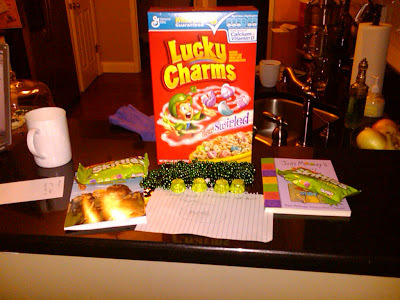 Our lucky leprechaun paid the kids a visit last night...did he visit anyone else? There was no time to make a trap for him last night but Ryan did leave a note asking him to leave gold, chocolate and "stuff" here on the counter. The leprechaun hasn't visited our kids since 2006 in Madison, Wi at Team McFarland's house. The kids that year built a trap for him but he escaped leaving chocolate and necklaces. The scramble began and what do you know...that lucky leprechaun showed up after all!